Public opinion shifted modestly toward support for gun control in the immediate aftermath of the school shooting in Newtown, Conn. on Dec. 14, 2012. Since then, there has been very little change in public attitudes toward gun control. In a February survey, 50% said controlling gun ownership is more important, while 46% prioritize protecting the right of Americans to own guns. Americans were also divided over what shootings like those in Newtown signified — 47% said they reflected broader problems in society while 44% saw them as the isolated acts of troubled individuals, according to a December 2012 survey. While the public was divided on the causes of the shootings, the 47% of those who saw the cause as a broader societal problem did represent a shift in public opinion from mass shootings that occurred in 2011 and 2012. 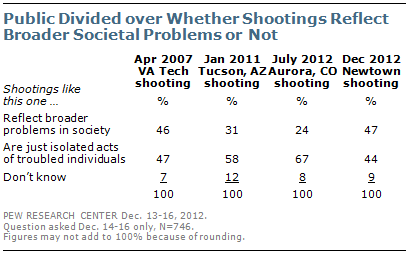 In the July 2012 movie theater shooting in Aurora, Colo. in which 12 people were killed, 24% had said the incident reflected broader societal problems while 67% saw it as the isolated act of an individual. In the Jan. 2011 Tucson, Ariz. shooting, in which former Rep. Gabrielle Giffords was seriously wounded and six killed, 31% blamed broader societal problems while 58% saw it as an isolated act. The divide now more closely reflects where public opinion stood in April 2007 after the shootings at Virginia Tech when 46% saw the cause as broader societal problems and 47% said it was an isolated act. In the December survey, women said, by 54% to 37%, say that the Newtown shootings reflected broader problems in American society. Men expressed the opposite view: 51% said that shootings like this are just the isolated acts of troubled individuals. College graduates (54%) are more likely than those with no more than a high school education (42%) to say that the massacre reflects broader societal problems.